Emergency services were called to the tyre fire at Leith Docks on Sunday. 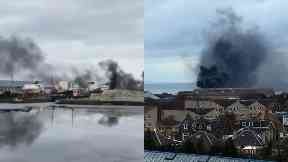 Emergency services are battling a tyre fire at Leith Docks. A single crew from Edinburgh's McDonald Road fire station were called to the blaze at Marine Esplanade at around 3.56pm on Sunday. A Scottish Fire & Rescue Service spokeswoman confirmed that no one has been injured in the incident. Eyewitnesses have been sharing pictures and videos of the fire online, which show large clouds of black smoke rising over the waterfront.